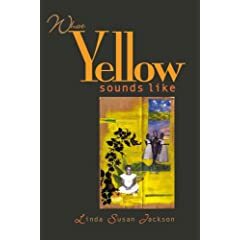 What Yellow Sounds Like by Linda Susan Jackson. The title of this debut book by Linda Susan Jackson does not lie. The sound of color is no problem for this painterly and musical poet. She grabs all our senses--her language creaks and smiles, swings, jitterbugs, roars, feels like velvet or that chair sticking to the back of your thighs on a hot day, smells like burnt hair, sweat, ironed shirts or grandma's parlor as the occasion demands. Each poem gives us a particular camera angle, a memory scrap. Bright and enticing, the scraps seem random, but as the bits and patches juxtapose, our minds start filling in the gaps and the invisible body; the landscape underneath is revealed. And by getting us to participate, Jackson invites us in. Using real and imagined letters, memories, family stories, Jackson weaves personal history with a richly imagined history of others. Her unflinching observation, vivid empathic response, pain, joy, and humor metamorphose into an open-hearted family geography. The book's prologue sets the stage, gives the core cast of characters: newborn daughter, mother, father, and a question. In supporting roles aunts and uncles, grandparents, brothers and children appear around the corners of the poems to come, but the prologue anchors us in Jackson’s territory--an impasto of the observed and the questions that follow, questions whose fissures spread out through the whole span of the work. The book is staged in four parts, which tend to group half and half. Part I opens with a girl's letter and Part II gets book-ended with a response (more on that later). The tone seems to change as we move into III and IV. It took me a while to figure out why the second half felt different; it was so subtle. But Jackson has such a sure hand with persona; there is almost a literal shift in stature. In the first half, Jackson writes with a girl's mask on. She is good at this. Reading some of these poems I physically felt small, as though seeing from about three feet off the ground. In the second half, the terrain changes because the mask changes. Jackson shifts us to full size: teenager to young womanhood to looking back on a life. She still paints her canvas with family and period and history, but the viewpoint is wryer, more knowing. Relationship to mother is no longer from the 5 or 6 year old, but the 16, maybe 20 year old and beyond. me with feelings, no words. or steel bowls filled with June peas . . .
between a smile and a lie). she is the price of a favorable wind. releasing Jamesetta Hawkins . . .
Jackson spins wonderful variations--she evokes Etta's life or mentions Etta in passing or we hear Etta's music in the background of a poem about something else. In and around Etta, Jackson leavens the mix, skillfully surprising us just when we think we know what's next. Many scenes could be old movie reels, so delicious and period is their atmosphere. There is even a poem "At Last"--our expectations tweaked; it is not a treatment of the song or even an Etta James poem per se (although she is mentioned). We step instead into another richly observed, richly period piece: "Six strapless peau de soie dresses/hung over different doors" with violins, bacon frying, percolated coffee hissing as it spills on the stove. Another slice we can't resist. Finally, to close the first half of the book, Etta writes back to the girl of Part I in a gleefully imagined letter poem, "Chile." The closing lines: "Yours forever/Miss Etta James//P.S. If you ever hit L.A., look me up." Connecting us to the girl's letter at the opening, this makes a charmed circle. Parts III and IV shift us. We begin to see the woman working to become a poet, bringing her tools to bear on the cauldron of material she has stored up. Now the poet has her own children, her own love affairs, husband, visits to Europe and to art museums. The reflections are more rueful: the body is aging, we witness death and mourn it, dreams are in a different tone. We leave Etta behind, but Jackson weaves in yellow in all sorts of ways, subtle or shining, through to the end. The theme of yellow holds layers of charge that will resonate differently with different audiences, but she welcomes everybody along. Underlying all Jackson's poems is deep music and musical play with language. There are sections when the caroming and play of internal rhymes and alliterations creates as much pleasure as watching a stone skipping over the surface of water, ping ping ping more times than seem possible. And despite the many disappointments, Jackson writes of emotional bonds, deep bonds, daughter mother sister brother, bonds that hold hurt but are unbreakable. All of us who write from inside weathered bodies know whereof Jackson speaks. "Wide/words spread so thin./You've said everything." Closing the book after this journey, I thought of Atticus Finch in To Kill a Mockingbird telling Scout “You never really understand a person until you consider things from his point of view... 'til you climb inside of his skin and walk around in it." On top of the stellar tactility of her language, Jackson's generosity in sharing her world is remarkable in a first book. A younger, maybe just a different poet might have hung his or her work on issues and boundaries, letting some readers in, others not, stirring the anger and guilt pots. There is a place for that, but I loved feeling welcome. It takes courage and groundedness to be that vulnerable. The work shines with it and I, for one, thank Jackson, a gifted poet with an open heart. Personally, I really look forward to the next course. Diane Schenker has lived on the East Coast, in the Bay Area, Seattle and Paris. She currently lives and works in New York City. Her reviews have appeared in Coldfront Magazine.